'Tis the gift to be loved and that love to return, 'Tis the gift to be taught and a richer gift to learn, And when we expect of others what we try to live each day, Then we'll all live together and we'll all learn to say, 'Tis the gift to have friends and a true friend to be, 'Tis the gift to think of others not to only think of "me", And when we hear what others really think and really feel, Then we'll all live together with a love that is real. Came across this fantastic movie while I was in Taiwan and the tour guide showed us this movie during our long ride to the next destination. "Front of the Class," was an especially touching story of a young man who would not let Tourette syndrome keep him from what he loved most: teaching. Reminded me of how I should not let anything stand in the way of a dream when he himself was an example of how as long as you have faith and belief, you do not have to convince people, but people will be convince by your sincerity and hard work. Before I continue, I'm sure many of you would be hearing this syndrome for the first time (just as I did) since nowadays many label into under autism I would think. Gilles de la Tourette syndrome is a condition that causes people to make repeated, quick movements or sounds that they cannot control. These movements or sounds are called tics. Most people with Tourette syndrome first notice symptoms during childhood, between ages 7 and 10. Symptoms of Tourette syndrome can range from tiny, minor movements (such as grunts, sniffling, or coughing) to constant movements and sounds that can't be controlled. Contrary to popular belief, only a small number of patients use curse words or other inappropriate words or phrases. I'm grateful that in Singapore, there is a support group for them. This movie is based on Brad Cohen's autobiographical book. Little Brad Cohen (Dominic Scott Kay) had Tourette’s Syndrome before the illness was identified. He would make strange noises, which upset his father (Treat Williams) and his teachers. They demanded that he stop, but he could not.They thought that it was a sign of rebelliousness , lack of self control, bad manners and that he was being a troublemaker. ( Such heart breaking moment. Its true how reality is harsh. Hence Acceptance is difficult for parents. I had volunteered among autistic centers for a number of years and have witness how many parents refuse to acknowledge the problem but keep asking for a quick solution. And also parents who split because one of them refuse to acknowledge. And some who blame it on having to handle the child's problem and hence not being able to handle their marriage. Truly my heart goes out to these parents. 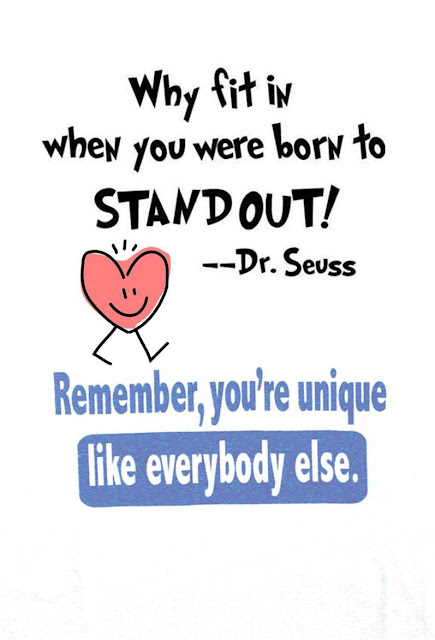 Specially when they face with societal stares and pressures.) But rather than only harping on the problem, what can we as individuals do? Brad attended school facing each day the ridicule of his classmates and teachers who reprimanded him for being disruptive. Changing one school after another. Thank God! One principal made a difference in Brad’s life. When he was sent by the teacher to the this principal’s office, the principal decided to do something about it. Not about Brad but about the perspective of his school teachers and students. This principal brought Brad before the school assembly and had Brad educate the other children and teachers about his constant companion, Tourette’s Syndrome. As a result, the school understands, applauds and starts to support him. This event leads Brad to wanting to become a teacher. He managed to teach in a small town but years later he decided to move to Atlanta (New big city) and this is where he faced all the colored eyes all over again! 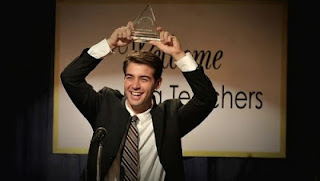 In Atlanta he ('Adult Brad' James Wolk) faces rejections one after another. He is highly qualified, but the schools are scared by his Tourette’s Syndrome. One even pushing him to the limit telling him if he can control his tics for an hour, he gets the job. Truly WTH. Finally, one school gives him a chance, and he excels. He was named Georgia's First Class Teacher of the Year. In between the stories, there was also a scene where his mother took him to a Tourette syndrome support group meeting, where Cohen realized that other attendees and their parents "seemed resigned to a life of defeat", He was then "inspired to triumph over the disorder. 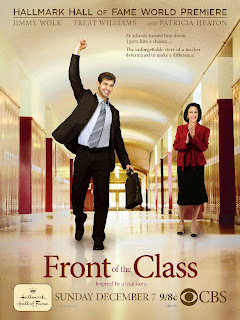 Front of the Class follows Brad as he works through a series of crushing disappointments, encounters overwhelming obstacles, and meets a girl who he can only hope will be able to look past his distracting condition. Whether or not his dream of teaching comes true, you’ll find him to be a one-of-a-kind man with a big heart and incredible determination, regardless of what the world thinks. Brad’s story as portrayed by this film teaches the principles of perseverance, diligence, resilience, love, and forgiveness. This movie resonate with honesty and the raw emotions from Brad and his mother was just amazing. Adding in also that love is possible for him was a nice touch, where it showed that nothing is impossible if you have faith in yourself and love just as you are. Last but not least, I want to say a BIG kudos to all parents who is facing similar situations. Here's a BIG shoutout to you! Ps: If you want to watch the whole movie on you tube, you can watch it by keying in " Al Frente de la Clase"
There is also banner space for rent on my blog too! Keppel Latin Film Festival " Espiral"